Shortly before I invited guests to dinner two weeks ago, we received another original glass piece from Karen Bourque to hang in the dining room window, a beautiful picture of the lotus flower composed of pink pearly shells, amber, and green glass. 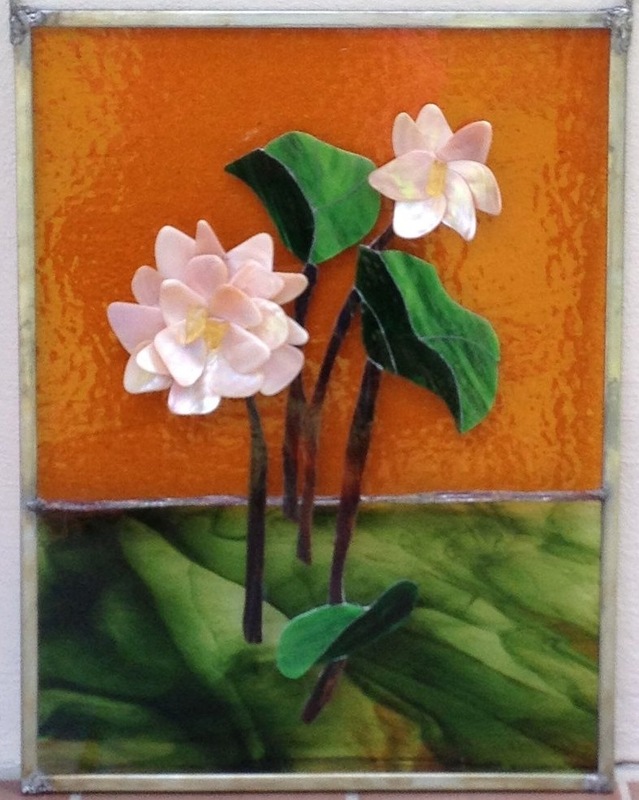 Karen, who lives in Churchpoint, Louisiana, has created glass pieces for numerous homes throughout Acadiana and large, commissioned pieces for the Louisiana Book Festival and the Ernest J. Gaines Center at the University of Louisiana at Lafayette. Karen explains that in this latest picture she tried to capture the lotus as a universal symbol, the primary theme being one of rebirth and purity. She drew the symbolism from Buddhist and Hindu traditions --the symbol of the fully-opened pink lotus, which is considered to be the true lotus of the Buddha. In the legend that accompanies Karen’s work of art, she says that the pink pearly shells used for the petals of the plant strengthen intuition, sensitivity, and imagination, adding that they also attract prosperity and wealth. The amber which she used for the flower’s stamen is believed to be a healing stone and brings blessings. It also helps dreams to become reality and calms those who suffer from hyperactivity and stress. An added bonus: the amber transmutes humor and joy, two qualities that should be a part of any household, especially at the dinner table! We love the three glass pieces that hang in the dining room, especially when the morning light streams through the windows and illuminates the various glass colors and stones imbedded in the pieces of art. The green colors in this latest work of art are particularly brilliant all day. The Lotus was a gift to my friend, Victoria Sullivan, who is a botanist and who has spent endless hours programming and designing my books of poetry for her independent press, Border Press. 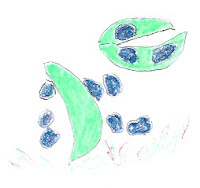 She writes about the lotus plant in Why Water Plants Don’t Drown, a book about water plants for which Susan Elliott of Pinyon Publishing rendered the lovely illustrations, which was published by Pinyon last year. In this biological and ecological text, Vickie relates that the pale pink flowers of sacred lotus are the largest and most spectacular of any water plants. A “floater,” as Vickie calls floating leaf plants, the lotus is native to India and is widely cultivated. She writes: “Buried seeds of the sacred lotus found in Manchuria were able to germinate after 200 years, and seeds may survive hundreds or even a thousand years.” Karen loved Susan’s colorful interpretations of the plants in Why Water Plants Don’t Drown and was inspired to render several botanical glass representations after reading this book about aquatic and wetland plants. Karen says that in the Christian religion, the waterlily, a variant of the lotus, was presented to Mary by the Archangel Gabriel at the Annunciation. It also represents enlightenment and is associated with the consciousness of those people who have reached Nirvana. Most of her glass pieces contain stones, gems, and colored glass that represent spiritual values—creation and regeneration are recurring themes. She encases the written explanations for the art work in a transparent sleeve that accompanies each piece she completes. In the fall when we return to New Iberia, we hope to make our annual pilgrimage to Churchpoint to view Karen’s latest work and to visit with her and her husband, Darrell Bourque, former poet laureate of Louisiana. Darrell’s latest book, Megan’s Guitar and Other Poems from Acadie is currently making a big splash in Teche country. Salut to all of these talented artists and writers! Three summers ago, my grandson Joel, who is now ten, and my daughter Elizabeth traveled from California by train to visit with me in Sewanee, Tennessee. Joel stepped off the train at Birmingham, Alabama with a fever of 102 degrees, smiling wanly, and his mother informed us that he had contracted a virus during the three-day train ride. 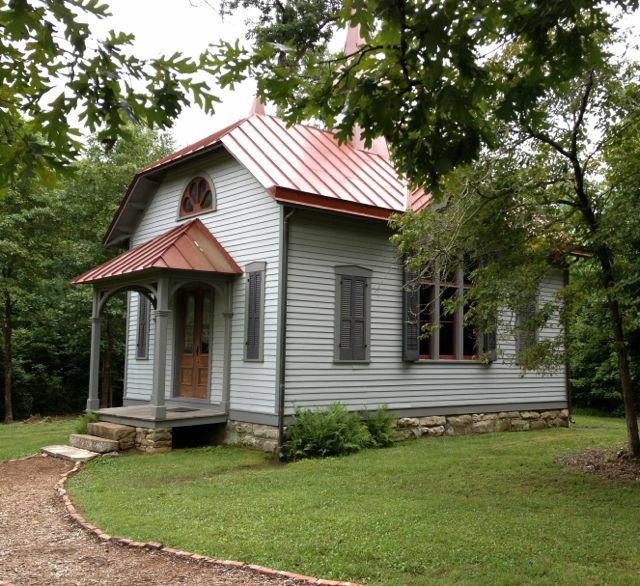 After we reached Sewanee, we put Joel to bed, and I awakened during the night when I heard him coughing in the next room. He said to me, with an almost-adult resignation, “I’m always sick.” The following morning after his arrival, he complained of not being able to feel his feet and said that he couldn’t walk. “The doctor says he has growing pains, and everyone else says this also,” Elizabeth explained, but nonetheless, we were alarmed. I rubbed his legs and feet with Biofreeze and set him up to watch cartoons for a day or so. Joel was a real sport about this mysterious malady, and when he vowed that he felt better, we set off for Gatlinburg to spend a week at a mountain resort. After a few days he rallied and even went swimming several mornings in a heated pool. By the time he and his mother left Tennessee, he seemed to have overcome the virus that had caused him to be unable to walk for a few days. Joel came into the world as a preemie, and his mother suffered preeclampsia before she delivered him. He has always had a small frame and inherited the family allergies, including asthma, but none of us were prepared for the diagnosis that he received a few months after returning to California from his Tennessee visit. 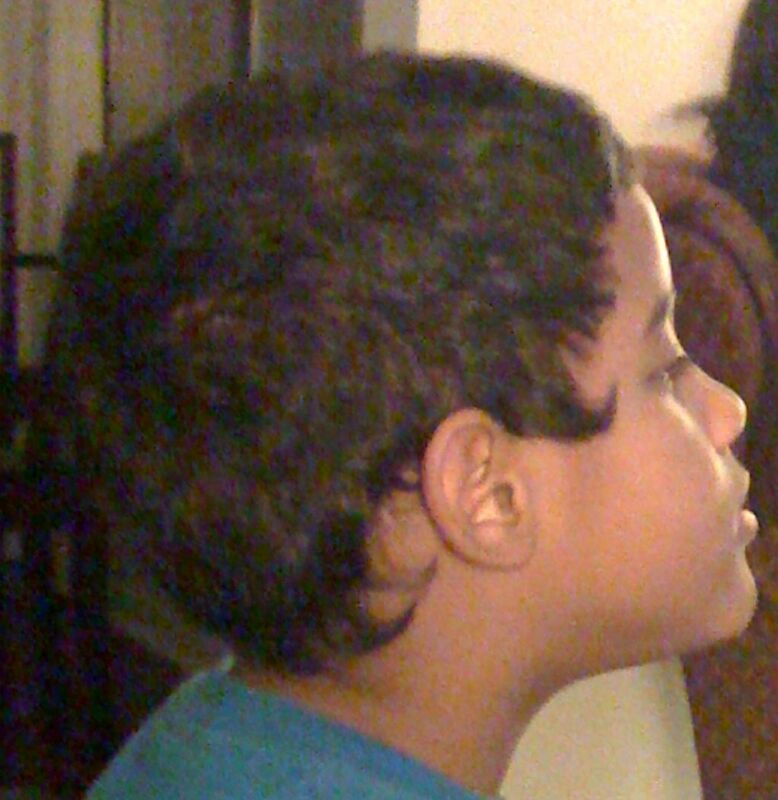 Pediatric doctors at the University of California in Los Angeles determined that Joel has the chronic, non-communicable disease of juvenile arthritis, a disease that lasts forever. Thank God his mother home schools him, and he’s able to catch up with his schoolwork after he experiences episodes of this condition. During an episode, he often has to resort to the use of a wheelchair because his ankles and knees are swollen, and if he puts pressure on these swollen places, he could permanently damage his joints. Despite these episodes, Joel remains a cheerful ten-year old with a lively interest in lizards, snakes (he’s the one who owns a corn snake), swimming in the backyard pool, basketball, and storytelling, but he often laments that his handwriting isn’t up to snuff because his wrists are so swollen he can’t form letters properly. Recent findings about juvenile rheumatoid arthritis indicate that almost 300,000 children in the United States have been diagnosed with this disease and it's at the top of the list of chronic childhood diseases – the onset of it claims more victims that juvenile diabetes, cystic fibrosis, and muscular dystrophy combined, which is a formidable and alarming statistic. The alarming factor is that pediatric rheumatoid arthritis diseases don’t receive research funding at the federal level or through private institutions that can compare with research funding for other childhood diseases. Leukemia, juvenile diabetes, muscular dystrophy, and cystic fibrosis receive hundreds of millions of dollars funding for research purposes, while pediatric rheumatoid arthritis disease research receives only two million dollars yearly! The message is that one of the pediatric diseases that afflicts 300,000 U.S. children (1 in 250) is a disease more prevalent than the diseases I mentioned above, but it’s severely underfunded by research agencies nationwide. I’m writing this because I hope that other mothers and grandmothers whose children and grandchildren suffer from this juvenile condition will write to their congressman or other governmental official and request that they back funding for research to discover a cure for this autoimmune disease, or that those parents and grandparents will write to the Juvenile Arthritis Association to find out how they can help raise awareness about the need for research. While searching for serendipity on the Cumberland Plateau, we made a trek to Rugby, Tennessee, a town on the northern part of the Plateau lying within the Clear Fork and White Oak Rivers. This unincorporated village was once the utopian dream of Franklin W. Smith who planned to relocate unemployed factory workers from the industrial cities of the Northeast to the woods and mountain air of Tennessee. Smith recruited a Brit to join him in his dream named Thomas Hughes, an English social reformer and author known for his classic, Tom Brown's Schooldays. Smith abandoned his dream, but Hughes actively pursued the idea of building a Utopian paradise in northern Tennessee. His intention was to build a class-free, agrarian community in which citizens engaged in cooperative enterprises, and I might add, governed by strict temperance. Established in 1880, Rugby, for a brief time, was known as an Eden on the Cumberland Plateau peopled with British emigrants and those of Scots-Irish or Welsh descent, along with a few Germans and African Americans. The utopian community suffered from severe winters and droughts in the summer, followed by a typhoid epidemic that decimated the population. The demise of the community was also complicated by the fact that most of the inhabitants were gentrymen unsuited to manual labor. Immigration to Rugby ceased, and by the 1920's, the total population had declined to 125 people of largely Appalachian descent. However, the town never became a ghost town, and by the 1960's, a young man from Deer Lodge, Tennessee named Brian Stagg had formed the Rugby Restoration Association, which later listed the town on the National Register of Historic Places. Today, twelve buildings have been restored or reconstructed according to historical standards. We ate lunch in the town's only restaurant, the Harrow Café, and I tasted a genuine Shepherd's Pie, the first I've sampled since I left Iran back in the 70's. Following lunch, we visited a print shop that still produces hand-lettered circulars and ads but doesn't publish the former weekly, The Rugbeian. One of the most interesting buildings in the village is the Thomas Hughes Library, which boasts an original 7,000-volume collection that has remained intact within the structure since 1882, the oldest free public library existing in the US. today. It includes the original collection, furnishings, and early checkout records and is painted its original three shades of gray. Film that blocks ultraviolet rays has been applied to all the windows, and the building has no air-conditioning. Had this been a Louisiana collection, it would have long ago been destroyed by humidity and mold. 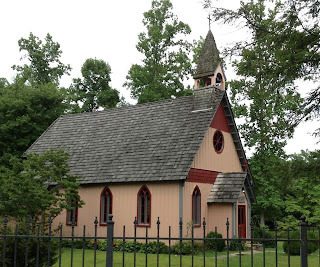 Another building that attracted us was Christ Episcopal Church, built in 1887, with original hanging and wall oil lamps that have been electrified. Services are held at 11 a.m. each Sunday, and the original walnut alms basins are still used to collect offerings. Our tour guide told us that the little church has attracted many converts who have moved into a new subdivision called Beacon Hill where the newly-built homes must be architecturally compatible with Rugby's historic structures. The day after our visit to Rugby, we drove to Berea, Kentucky, known as the Folks Art Capitol of Kentucky and home of Berea College, the first interracial, co-ed school in the South. The town was named Berea after the city in the Book of Acts, and one of the town founders, Rev. John G. Fee, was an abolitionist who felt he was called to spread the gospel of love, which included the freeing of slaves. His mission was to promote equality for men and women of all races through learning, service, and labor. Today, eight percent of enrolled students from countries outside the U.S. attend Berea College, and a sizable percentage of the student population is Black. Berea was founded on the vision of an egalitarian society where all students could achieve their academic goals, and the college is also known for its "no tuition" tradition. When we visited the Berea Tourism and Welcome Center located in the old L&N Train Depot, we found serendipity in the Madison Dulcimer Group, one of whom was a Haik related to Ted Haik of New Iberia, Louisiana. 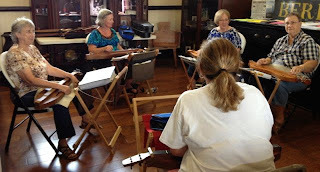 The group, composed of four dulcimers and one ukulele, discovered we lived in Louisiana part of the year, and promptly set up the sheet music to "A Cajun Waltz" and played it for us, then performed "Amazing Grace" as an encore. The ceramics, woven goods, pewter, jewelry, and woodcraft on sale in Old Town Artisan Village, Kentucky Artisan Center, and College Square in Berea offer a dizzying array of folk crafts where the creation of these crafts are also demonstrated within many of the shops. We weren't surprised to learn that Berea has received numerous awards from national and international publications, including being named one of "America' Best Small Towns" for several years. We regretted that we weren't able to stick around to hear some of the music performed by the Black Music Ensemble from Berea College, the Bluegrass Ensemble, Wind and Jazz Ensembles, and the "Jammin on the Porch" summer concert on Thursday evening. A few months ago, I visited Andalusia, home of Flannery O’Connor, one of the foremost writers in the South. 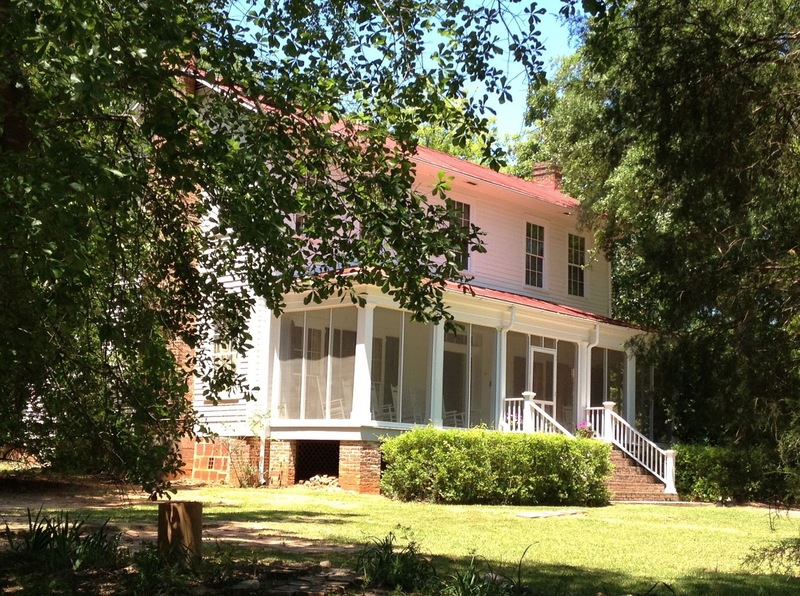 I came home with a thick volume of her work, including some of her “Occasional Prose” and wrote a blog about my visit to this peaceful property in Milledgeville, Georgia where O’Connor once lived and wrote. Since that time, I’ve had an abiding interest in her work and am sorry I missed a lecture last week entitled “Surprising Grace in the Writing of Flannery O’Connor” given by Rt. Reverend Henry Parsley, the retired 10th Bishop of Alabama and a former Chancellor of the University of the South. 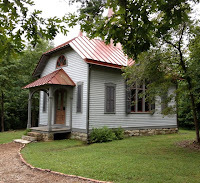 The lecture was sponsored by the Academy for Lifelong Learning which meets each month at St. Mary’s Conference Center here at Sewanee, Tennessee. This week, on the heels of this lecture I received an e-mail from my good friend, Dr. Mary Ann Wilson, an English professor at the University of Louisiana at Lafayette, telling me about her latest connection to Flannery O’Connor’s work. Dr. Wilson was featured in a recent issue of La Louisiane, the magazine of the University of Louisiana at Lafayette, in which she was cited for discovering a 50-year old tape of an O’Connor lecture. The tape is a valuable recording of a talk O’Connor presented at Our Lady of Wisdom Catholic Church on the ULL campus just two years before she died of lupus during the 50’s. Dr. Wilson was cleaning out her office files at the University when she came across a pink box with O’Connor’s tape entitled “The Catholic Writer in the Protestant South” (of which I have a print copy). She took the brittle tape to the University’s Center for Louisiana Studies and they used digitizing equipment to produce a 35-minute recording. The recording inspired Dr. Wilson to organize and coordinate a symposium that featured O’Connor scholars from throughout the U.S., and the audience heard parts of the recording during the sessions. The symposium was hosted by Our Lady of Wisdom’s Jeanmard Center in November, 2012. Dr. Wilson reports that the tape captured the soft, South Georgia drawl of Flannery O’Connor, and applause and laughter punctuated the lecture O’Connor presented. Wilson teaches courses in Southern literature, many of them centered on Southern women writers, including O'Connor, this distinctive American writer of the twentieth century. She says that a colleague gave the O’Connor reel-to-reel tape to her years ago, and she forgot about it until she did a spring cleaning in her office. O’Connor scholars in the South are indebted to Dr. Wilson for rescuing this tape and getting it digitized for a permanent collection in the Edith Garland Dupre Library at ULL. The article about Dr. Wilson’s discovery appears in Volume 23, Number 1 of La Louisiane, a publication published twice a year at the University of Louisiana at Lafayette. Grandfather set down two washtubs of speckled butter beans – a Mt. Hermon farmer’s harvest of plenty – on the back screen porch and grinned at us. He had a wide mouth, and his grin covered his entire face. He was hardly ever serious because he said he was a Greenlaw, a bona fide Scot, and Scots were known to be practical jokers. In 1943, fifty cents looked like a good deal to us. Paul was ten; I was eight, and neither of us had earned over a quarter for doing chores in our household. We smirked at one another and began shelling. Four red, sore fingers and four hours later, we had done one tubful. We worked steadily in a silence broken only by the buzz of the sawmill further up 10th Avenue. Our grandmother stayed in the kitchen next to the porch because she disapproved of Grandfather putting this Herculean project in our hands. The noon whistle whined and died, but no one called us in, and we plodded on, heaping shells on the green painted concrete floor of the porch. At first, it had been fun to see the fat speckled bean pop out as we peeled back the shell, but amazement quickly turned to monotony. Mutual, fast shelling became a matter of who could lollygag the longest. After all, we were to be paid equal wages, so it didn’t matter who did the most work, Paul said. My grandfather came home for lunch, patted us both on our damp heads and didn’t offer for us to stop working. I could hear my grandmother in the kitchen admonishing Grandfather about “child labor.” We had begun to sweat heavily, and the beans were early salted. When 4 p.m. showed on the Motor Sales clock that hung on a solid wall leading into the kitchen, we sat staring down at an inch of beans lying at the bottom of the second tub. Grandfather came home early because he said he hadn’t sold anything except a handful of auto parts that day. “Well,” he said to my Grandmother, who had finally decided to check on us, “do you need help canning these beans?” He gave us an evil grin. My brother and I looked at one another and stood up, then left the porch, letting the screen door bang behind us and not looking back at the inch of beans on the bottom of the second tub. We sat under the pear tree in the side yard until dark when Grandfather came out to look for us. “I shelled the rest,” he said. “And I paid myself twenty-five cents for finishing the job for you.” He didn’t bother to smile and turned to go inside where my grandmother was waiting supper on us. I heard him saying something about being a good Baptist and to remember the parable of the workers in the vineyard to my grandmother, who mumbled the words “proof texting.” I went to bed early, my heart filled with spite…and my stomach gnawing with hunger…but not for butter beans. Paul ended up thanking him, but I quit going down to Motor Sales in the afternoons where I had worked the adding machine, pretending I was selling cars for my grandfather. I no longer wanted to be a businesswoman. It seemed like business people skimmed the best off the bottom of the tub and cheated the ones who did all the labor. However, three years later, when I broke my front tooth playing croquet on my grandparent’s side lawn and Grandfather Paul had to witness me squirming in a dentist’s chair, he gave me $25 to spend on whatever I liked… and I didn’t have to perform any tasks to earn the money. But I have trouble digesting butter beans to this day, especially speckled ones. 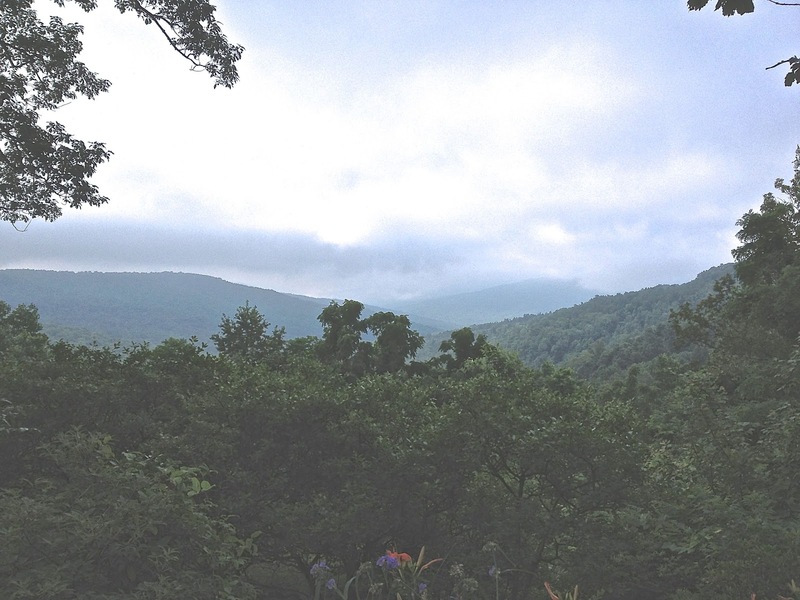 While residing in this “mystical forest” in Sewanee, Tennessee, I’ve completed another book of poetry which is now available on amazon.com and, of course, at Border Press. I’m blessed to have the quiet time necessary to write while living on The Mountain, and some of the poems are about my life here. 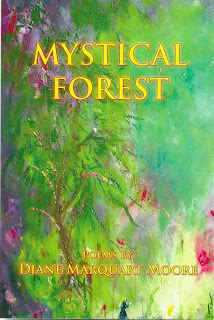 The title poem explores the feelings of an artist (my brother Paul) when he painted his perception of a mystical forest for his wife, Lori. A section of the book focuses on another chapter in the ongoing “Going to Diddy Wah Diddy” saga, a saga fueled by postcards my mother bought on my childhood journey to California during the 40’s. Other poems focus on everyday life and people in Louisiana and on the Cumberland Plateau, as well as a poet’s struggle with the past and aging. “Mystical Forest is a feast of a book. It finds its spiritual rhymes in poets as various as Donne and Herbert, as various as Hildegard, May Sarton and Mary Oliver. Diane Marquart Moore is a metaphysician who brings the sacred to this world she loves even with the dirt and grit ever in it; even with the hurt and wound ever a part of the mystical pact. Just as she loves and honors the imperfect world in these poems, so too does she love and honor whatever comes before and whatever comes afterward. If you should hear something like the birdsong of Olivier Messiaen and the risings in Arvo Pärt’s compositions when you read these poems, you are not just hearing things. Moore is that good.” –Darrell Bourque, author of Megan’s Guitar and Other Poems from Acadie, and former Louisiana poet laureate. 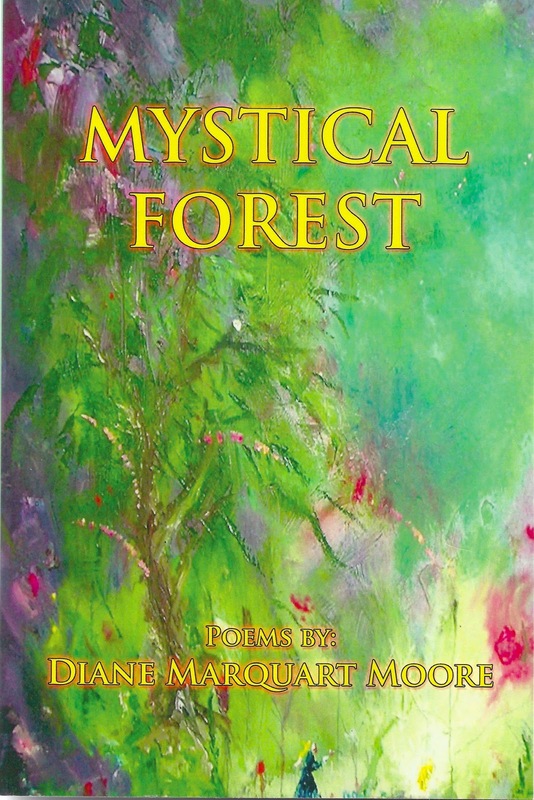 “‘A small world blooms/at the edge of a disturbed bay’ in numerous poems of Diane Marquart Moore’s newest collection, Mystical Forest. Whether in an affirmation of solidarity out of a history of abuse (‘Barbara’s painting’) in solitary prophecies received on a family pilgrimage by the young poet-to-be, or in a couple’s intimate twirl on the dance floor of the world (‘Dancing With the Stars’)–Moore’s poems illuminate small worlds with precision and poignancy as though one is entering the mystical purple light of her artistic mother’s ‘fragile dream.’ Is the real world truly the ‘backyard of paradise’? Could an owl’s hole in a tree offer a refuge of escape? Can a blast of Mozart sonatas evoke a world to counteract the doldrums of a gray winter’s freeze (‘Too Much Gray in the Day’)? These artfully crafted poems–‘words creating the plenty/of moments left standing’ – answer Yes.” –Isabel Anders, author of Miss Marple: Christian Sleuth; Becoming Flame; and Spinning Straw, Weaving Gold. “With a poet’s craft, with a painter’s eye, Diane Moore’s evocative poems lead to places that are personal and universal. ‘Giving birth to simple insights,’ Moore writes – just one more reason to follow her on a rewarding journey.” –Michael Miller, author of Into This World. “This wonderful collection sings of friends, family, and place, but also of loss, regret, and wonder – all part of a life well lived, richly imagined, and beautifully expressed. Its poems resonate with clear observation and earned wisdom. Whether tracing a childhood odyssey out west, or simply capturing the landscapes of her Louisiana and Tennessee homes, Diane Moore gives us a world that brings us back to our own with renewed clarity and insight.” –Mary Ann Wilson, Departments of English and Women’s Studies, University of Louisiana, Lafayette. I’m humbled by the endorsements these fine writers have written about Mystical Forest and hope that you enjoy this, my 34th book. This morning is a retro morning. When I emerged for breakfast at 7 a.m., just as the coffee finished perking, the power went out. No rainstorms were deluging us; no high winds gusted outside; no fuse boxes had blown. True, the morning gray clouds still blocked the sun, but there was no visible reason for a black-out. It was cold cereal time at my breakfast table. 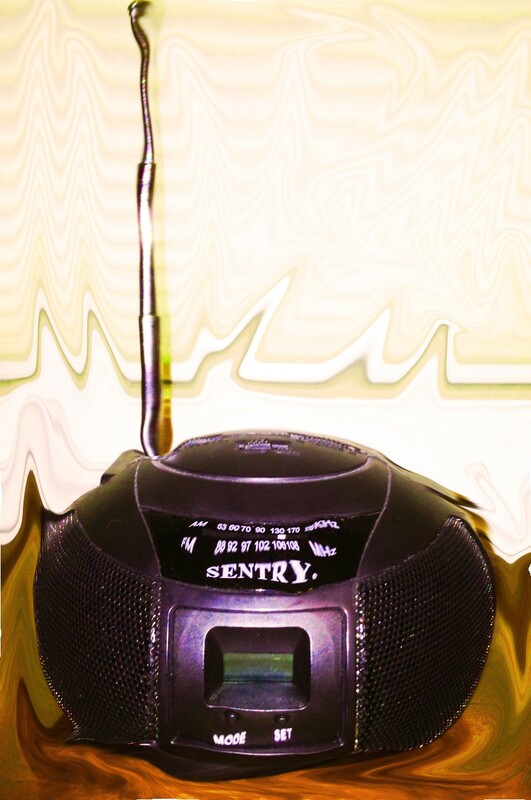 A few years ago when we had a major power outage, I bought a round, battery-operated object that looks like a flying saucer for just such emergencies and amused myself for an entire morning with broadcasts about Franklin County, Tennessee. The little round object could have been from outer space, the way it crackled and spit out voices, but the excited announcer kept us updated about the progress of work being done to restore power on The Mountain. In between broadcasts, we used the iPhone to get bulletins from “Classifieds” here at Sewanee. “Classifieds” is a service that advertises, yes, but it also sends electronic messages about everything from lost dogs and cats and house rentals to reports about lurking coyotes in the area. Also, when power goes out, people report the areas that have lost power. No need to call Duck Electric Company, our local service, “Classifieds," does its best to keep us apprised of emergency situations. However, this morning, the broadcast that kept us updated was one issuing from the flying saucer radio station, which received telephone calls from as far away as Knoxville regarding the outage. “You must have forgotten to pay your electric bill,” the announcer quipped to one caller, and the caller responded, “I don’t have no generator like you,” click…Exactly an hour after the outage occurred, a cheerful voice from Duck Electric called in to say that he was sorry for the inconvenience but a fox squirrel had gotten into the works in Decherd and caused the black-out, and we'd receive power within a few minutes. The radio announcer had predicted that the outage was due to either a squirrel or a deer thrashing about. Only on the Mountain, I said to myself. But thank God for radio. I always love to hear NPR broadcasts while traveling in a car and have access to nostalgic radio programs from satellite radio that take me back to the 40’s when radio was at its zenith. My grandfather Paul would be happy if I stayed tuned in to my flying saucer broadcasts all day as he was a dedicated radio listener who had his own radio station in Franklinton, Louisiana, which I mentioned in a previous blog. Lightning struck his equipment room and set it afire back in the 30’s during the Golden Age of Radio, but he kept his enthusiasm for radio broadcasts until he died in 1947, listening to “Amos /N Andy,” “The Fred Allen Show,” and other comedians who flourished during this period of radio history. During the early 50’s, radio saved the day for many military personnel stationed at a SAC base in Limestone, Maine on the Canadian border, and we were among those associated with the Army who went to bed at nightfall, turned on an electric blanket and the “Tennessee Ernie Ford Show” simultaneously to survive the cold wintry nights in Aroostook County. As I said when I began this blog, it’s a retro morning. I’ve placed the flying saucer in a conspicuous place atop a bookcase and have vowed to do more than dust it off every week. I hope it doesn’t decide to spiral off into the universe, because we never know when another squirrel is going to get in the works and cause us to pause for a rural electric intermission on The Mountain at Sewanee. Every morning when I wake, I open the French doors in the living room and look out at the woods bordering our front yard to get my shot of a vista for the day. Although I’m not a hiker or camper, my parents were inured to both activities, and I was taught to appreciate the outdoors. A copse of trees, as well as a great stretch of desert, are sacred sights to me. One vista often reminds me of another; e.g., the road leading to the valley in Cowan, Tennessee reminds me of the curvy Highway 1 leading to Big Sur, California, sans Pacific Ocean on one side of the road. I’m always inviting people to view different vistas, and today my thoughts turn to Ben Blanchard, who will be married in Austin, Texas this afternoon. Ben once accompanied his mother, Janet, one of my best friends, on a trip we made to California. Ben was ten and a reluctant traveler, and he balked at every curve when we traveled the road to Big Sur and Point Lobos, often dozing or sulking in the back seat of the car as we passed through magnificent scenery – rugged cliffs, canyons, long meadows, and redwoods, stopping to explore narrow inlets where we could get a better view of the greenish blue waters of the Pacific. I’m not sure it was an entirely miserable experience for him because a few weeks ago, word came that he wanted to take his bride on a honeymoon to California – and guess where he wanted to go? Of course, he wanted to retrace his steps up Highway l to Big Sur! You never know when you have effected a “travel take” with offspring, but if they’re exposed to vistas at an early age, they’re likely to develop wanderlust and appreciate the outdoors. I never fully appreciated the trip to Diddy Wah Diddy (California) that my father initiated back in the 40’s and earned the title of “luxury-loving girl” because I wasn’t too keen on the idea of campouts along the way. However, by the time I reached my twenties, I had a full-blown case of wanderlust. And, in my thirties when I went to Iran and lived there two years, people thought I had lost my mind because I enjoyed my sojourn in the southern desert of Khuzestan – so much so that I’ve written four books about the experience. In my forties, I began traveling to California every year and became enraptured with the deserts of southern California and Nevada. Landscapes affect me deeply, as they do most poets. When Robinson Jefferson moved to Big Sur, he became spellbound with the rugged coast near Carmel, writing that “the coast had displayed all its winter magic for us: drifts of silver rain through great gorges, clouds dragging on the summits, storm on the rock shore, sacred calm under the redwoods…” I was just as enchanted with my first glimpses of that rocky California coast, and the wild beauty of it had a lasting effect on me. Actually, if I had my druthers, I’d live in Carmel, California, but my senior’s purse won’t allow that luxury. I’m happy that Ben will get to see all the natural beauty of the central coast of California when he makes a return trip to the scene that he scorned as a young child – this time with fresh eyes, and I expect the experience will be overwhelming for him and for his bride. 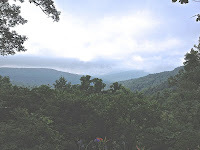 Meanwhile, I will think about his trip vicariously and continue to record the beauty of the landscape here on the Cumberland Plateau, including a photograph of the Cumberland Valley as seen from the backyard of St. Mary’s Convent accompanying this blog. This is a message from the administrator of A Word's Worth, which may affect subscribers to Diane's blog. Subscribers to this website are notified of Diane's new posts through Feedburner RSS. Here's the rub. Google is discontinuing this service, meaning that if you use Feedburner to subscribe to A Word's Worth, your subscription will end. HOWEVER, you can choose another way to subscribe. I recommend www.feedly.com. It's free, simple to use, and will automatically transfer your subscriptions from Google's Feedburner RSS to Feedly. I will do everything I can on this end to keep new postings coming to you. 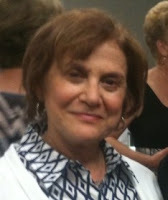 Diane appreciates her vast, worldwide readership and wants to make it as easy as possible for all her readers to get her new postings on A Word's Worth (www.revmoore.blogspot.com). If you have questions/concerns, please email Diane at deacondmoore@aol.com. If you have your own blog, take note of this action by Google and notify your subscribers. Feedburner RSS is the most popular way to subscribe to websites, so, you will want to make the necessary changes. This notice doesn't apply to the 10 readers who receive direct notice of Diane's new postings by email.